Learn about the different types of rock formations with these printable geology flash cards. Lithosphere "Sphere of stone" a region of the earth's crust and upper mantle. Plates Several "floats" like rafts on the plastic rock of the upper mantle. Fault Fracture zone - at the boundary between stationary rock and moving rock. 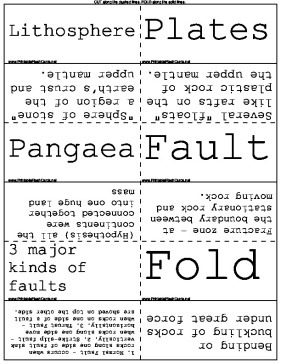 3 major kinds of faults 1. Normal Fault - occurs when rocks along one side of fault sink vertically. 2. Strike-slip fault - when rocks along one side move horizontally. 3. Thrust Fault - when rocks on one side of a fault are shoved on top the other side.